On the 25th June 2009, the world lost an icon. Now, that word is used a lot but what does it mean? Well according to the internet, an icon is “a person or thing regarded as a representative symbol or as worthy of veneration” and although the word is used a lot, in this particular case, as we mention the death of American singer, songwriter, record producer, dancer, actor, and philanthropist Michael Jackson, it is definitely apt. When he died, he left behind a huge backlog of some of the best music ever produced and in Thriller Live at London’s Lyric Theatre you can have the chance to experience them in a way that would make Michael proud. Although advertised as a musical, Thriller Live is not a traditional show in that respect. It is more of a wonderful concert taking the audience from Michael’s early years with the Jackson 5 through to his world record achievements as a solo artist with massive hits ‘Thriller’ and ‘Bad’. In order to cover the range of music, there are six lead singers ranging from young Marcellus Virgo-Smith at the performance I saw to the adult performers which included the wonderful voice of Cleo Higgins. Thankfully, there is no attempt to build some sort of story in the show, although there are some minor interludes as the cast speak about Michael’s life. Instead, the spectacle of the show is there for the audience to see, live and enjoy. And believe me enjoy it you will. Whether you are a huge fan of The King of Pop or just thought Michael J was a pretty good singer, you cannot help but be pulled into this highly artistic and energetic celebration of his work. Everything from the amazing set – a sort of bridge surrounded by wonderfully versatile Tetris pieces – by Jonathan Park, and intense lighting designed by Nigel Catmur, through to the easily recognisable Jacksonesque costumes, is pulled together by Director/Choreographer Gary Lloyd to set the scene for a fantastic performance by an energetic cast of dancers and singers. This is a show that doesn’t sit still and the line-up of performers changes as does the song list – let’s be honest – Michael Jackson’s back catalogue is so huge that you could do a different show every night and still not cover every one of them. However having said that, certain songs not only have to be in the show but also have to be perfect. So expect a fabulous, zombie-filled rendition of ‘Thriller’ and the gravity-defying movements in ‘Smooth Criminal’ not to mention some of the smoothest ‘Moonwalking’ you will ever encounter. The production is fast-paced and amazingly energetic and I was actually surprised that when it finished over two hours had elapsed, time is not something you think about as you sing, clap and occasionally dance your way through. By the end, near enough everyone was on their feet and yelling for more – I wouldn’t have minded another hour or so. I was lucky enough to see Michael Jackson live at Wembley in 1997 and have to say, this is the nearest thing to that concert that I can imagine. 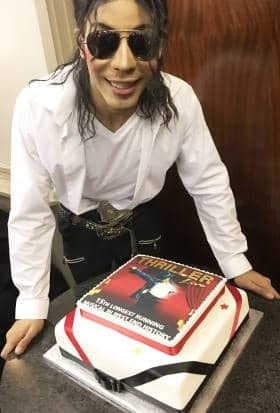 Michael himself may be dead but with Thriller Live – just celebrating becoming the 15th longest running musical in the West End – delighting audiences eight times a week his music lives on. In a career spanning 40 years, Michael Jackson’s Thriller has over 100 million sales worldwide and 1 billion total sales. (Michael Jackson’s ‘Thriller’ Becomes First-Ever 30 Times Multi-Platinum Album) Thriller Live includes over two hours of non-stop hit songs in a show that recaptures the dazzling spectacle of Michael Jackson’s legendary live performances. Expect your favourite Jackson songs delivered by a super-talented cast and band, including the smash hits: I Want You Back, I’ll Be There, Show You The Way To Go, Can You Feel It, Rock With You, She’s Out Of My Life, Beat It, Billie Jean, Earth Song, Thriller and many more.